Seeking advice with regards to the size of disc brakes for front wheel. 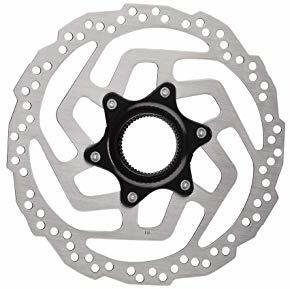 Could you kindly advise - would a 160mm brake disc be suitable for a cube MTB - front wheel size- 559x17-21c I do not have a picture of the bike at present, if necessary I could get it and send it later. Not sure of the model either. As you wrote, your bike already uses 160 mm Centerlock disc at front. If you need a new disc instead of worn/damaged old one, any 160 mm Centerlock disc will be compatible. There are some concerns about certain brake pads types not being compatible with all disc types, but in my opinion it does not matter, all pads just work with metal discs. Do not go with different diameter of discs unless you experience lack of stopping power. If so, bigger 180 mm discs may be an answer, but you'll need to check if they are compatible with your fork and won't break bicycle warranty. Besides, an extra/different adapter is usually needed to install a disc of a different size. Not the answer you're looking for? Browse other questions tagged mountain-bike brakes disc-brake mechanical or ask your own question. How do I know what brake rotors to get for my bike? Can I use a Center Lock hub and disc brake rotor in place of an ISO hub? Rear disc calliper won't fit, disc mount bent? Retrofitting disc brakes on 2000 Specialized Stumpjumper FSR XC? While on a ride, realised rear disc rotor was contaminated, what could I have done? Hayes Sole Disk Brakes, adjusters stiff/seized?